On 1st January 1899, the UK adhered to the UPU Insurance Agreement, making it possible to exchange insured letters of declared value (Valeur Déclarée) with many other countries. The service was intended for valuable paper and documents, rather than precious metal or dutiable articles, which had to be sent via parcel post or (later) as Small Packets. Letters had to be carefully sealed, and red or pink labels were used to mark the letter as insured. 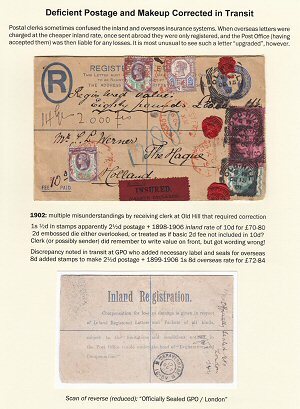 Although the UK treated declared value letters as essentially an additional service on top of registration, this was not universal; countries with separate registration and insurance systems frequently crossed out the indications of registration on insured letters from the UK. However, a separate insurance system for inland letters and parcels, based on a higher registration fee, was already in existence. There were repeated injunctions to postal staff in the Post Office Circular not to confuse the two (see below for an example that describes the system), but the existence of completely different systems, and specific rules that applied to insured mail, naturally meant that mistakes occurred, resulting in insured letters with postal irregularities of one kind or another - the subject of this exhibit.